Non-stick, non-skid saves time and flour. Use for finer pie crusts, pastries, cookies and noodles. 1 - 100% heavy weight cotton pastry cloth with finished sewn edges - measures 20"x24"/51cm x 60cm. 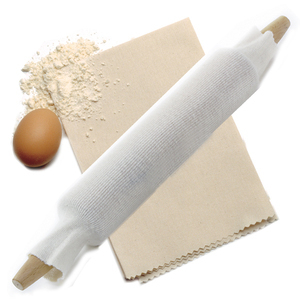 1 - 100% cotton knit rolling pin cover - measures 14"/35.5cm.